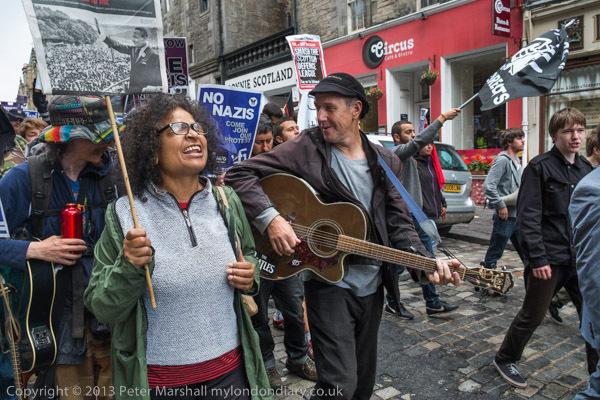 Among the hundreds or thousands handing out postcards on Edinburgh High St for their various performances, one small group stood out. They had a rather different demeanour and what they were promoting was not themselves as a part of the festival but a political demonstration, or rather a counter-demonstration. 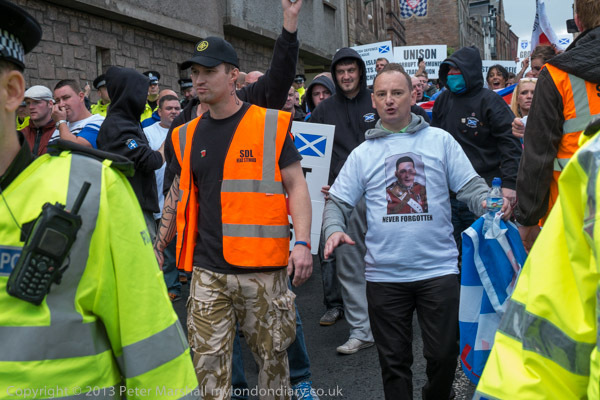 They were appalled that at a time when Edinburgh was bursting with people it had welcomed from all around the world, the ‘Scottish Defence League’ (SDL) had been given permission to march through its centre. 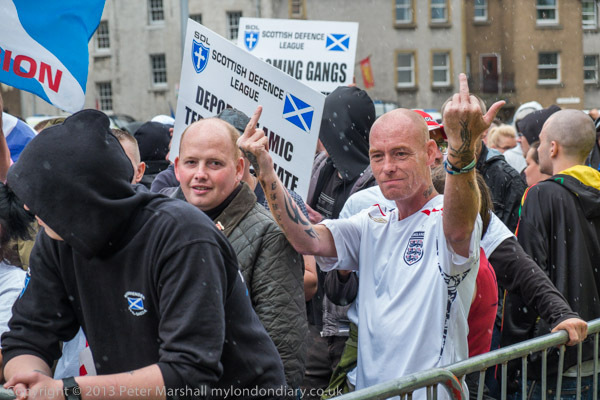 Having photographed the EDL on many occasions I had no doubt about the kind of organisation and views that their Scots counterpart would have, and decided to cover the event. Fortunately the play we had tickets for on Saturday morning was only a short walk from where the anti-racist counter-demonstration was forming up. It was a good performance, and one of the few we went to where every seat was occupied, and it took a little while to get out along a narrow corridor (I did worry about the fire risk at some of the venues we attended) but finally we got out and rushed to the protest. It felt a little strange walking across the street to the front of the march. The policing seemed a little more vague at this point than it might have been in London (though later it became more impressive) but the big difference for me was that I saw no faces I recognised, either among the protesters or the few photographers around. And also that instead of having a heavy camera bag with a couple of Nikons, flash and several heavy lenses, all I had to cover the protest was the Fuji EX-1 with its 18-55mm zoom and the 15mm Voigtlander. On holiday too I’d not managed to do the kind of research that is a part of my normal routine, looking up the planned routes of the two protests and working out where I might go to cover them. In London I would have normally tried to follow the EDL from their meet up point, but I’ve no idea even now where the SDL were marching from. 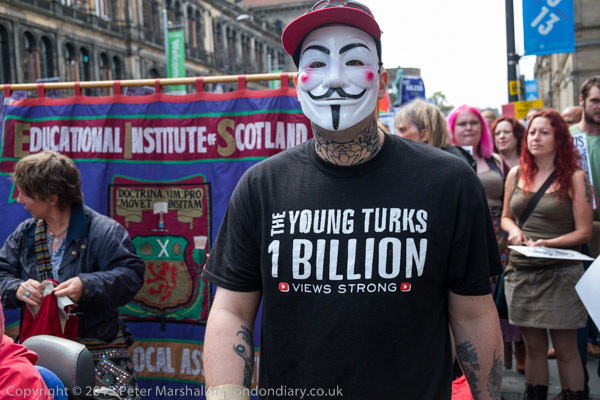 Later I did meet a few photographers I recognised by sight, who had doubtless been with the SDL at the start. The counter-protest did seem a little less organised than I expected, and though there were a few speeches (I’d come late and probably missed more) the crowd seemed just to be standing around waiting for the march to start. I got down to taking a few pictures, and the slower focus of the Fuji with the zoom was very noticeable, and I very much missed the longer reach of the 18-105mm Nikon. It was a dull morning with the occasional sunny spell and the odd spit of rain. There isn’t much reason to use low ISOs with the Fuji and I was working at ISO 1250. There is a choice of Spot, Average and Multi metering modes on the Fuji, and I had the camera on spot for the first few frames, which predictably gave some exposure problems, and things got better when I changed to multi. Spot is the best option when you have time to think carefully about what you are doing and place your exposure carefully, metering from a suitable mid-tone, but not when you have to grab pictures quickly. I don’t think Fuji’s Multi metering mode works as well as Nikon’s Matrix, but it does a reasonable job. I’m not sure when if ever I would want to use Average. The slower reaction of the Fuji did mean I missed some pictures, and the lens perhaps showed a little more flare from bright skies than the Nikon, but I was reasonably happy with the pictures. I left the march shortly before the end and went looking for the SDL, who hadn’t yet arrived. I found them coming down Canongate, surrounded by a fairly tight ring of police and was able to get a few pictures before they reached their pen. Again I missed a longer focal length, and it was rather trickier to get focus on the moving subjects. At Hollyrood where the two marches both ended, police did a very good job and keeping the two sides apart, but it wasn’t too great for photography, as we were unable to work from the front for either group. 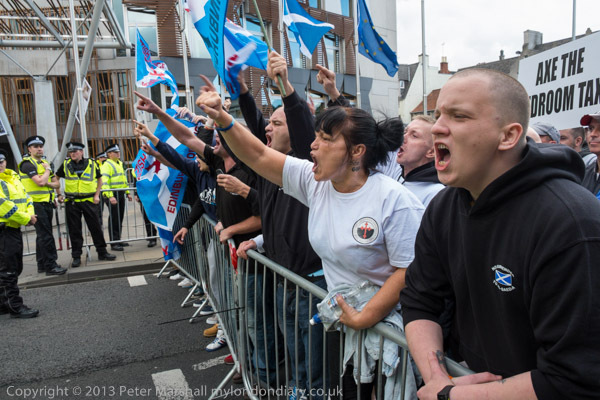 I took a few pictures of the SDL (and there were quite a few EDL among them, a few whose faces I recognised.) With people penned in and relatively static the Fuji worked reasonably well, though I still missed the better optical viewfinders of the Nikons. There were a few what seemed rather pointless arrests I could photograph, but access to the actual protest was poor (the 300mm would perhaps have helped.) Nothing much was happening and it started to rain a bit more and it seemed a good time to leave. It wasn’t really a fair test of the Fuji – I had only one body and a limited lens range – and the results weren’t bad. But given the choice I’d still pick up the heavier bag. 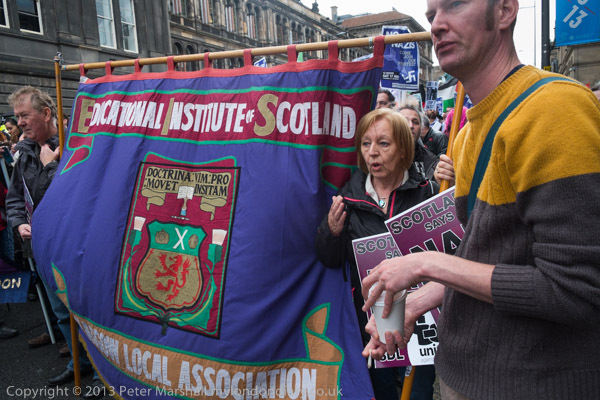 You can see the story and the rest of the pictures at SDL and UAF in Edinburgh. This entry was posted on Monday, September 23rd, 2013 at 09:11 am and is filed under My Own Work, Photo Issues. You can follow any responses to this entry through the RSS 2.0 feed. You can leave a response, or trackback from your own site.